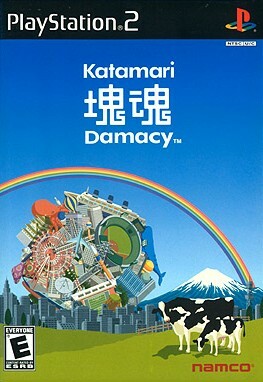 Katamari Damacy – time for something weird. The goal of the game is apparently to roll a ball that objects stick to, and make it as big as you can within the time limit. It’s such a bizarre idea, I think it’s something we need to play to understand. Katamari Damacy is a fun game. The whole setup smacks of insanity – I’m not sure I get what the story is meant to be, it’s something about how the stars have disappearaed and that you need to rebuild them. You do that starting with a small ball, rolling it around while things stick to it. The larger your ball is, the larger the things are that can stick to it – a pencil is an obstacle early on, later you just grab it together while you’re chasing after a dog to add to your pile. The ball handles differently based on what’s attached – the aforementioned pencil, if it’s still big enough compared to the ball, hobbles the ball and can pull it to the side. The amount of items that can go on is staggering, with an extensive physics simulation, and there is a lot of added unlocks once your ball gets big enough to clear hurdles (some of which are put in the place by the game intentionally to gate areas). Where it all falls flat is with the controls. Rather than just using a console stick to maneuver, the game expects you to use both sticks on the controller, moving them in tandem, or not, to control it. While that may sound neat, it is actually pretty clumsy, and combined with the physics the game often feels like the challenge is handling the controls rather than growing your ball. It’s too imprecise to work with it. It’s a shame, because it really holds back an otherwise great game and concept. A great game, very interesting concept and just whacky story, marred by the execution. It’s sad, really, as I probably would have played a lot more of the game if it wasn’t for that. I hope the sequel will do it better, as I’m already looking forward to a better version of this!